Hi friends. I have been awfully quiet on the blog front, but it's been with good reason. I had my sister and her sweet girls visiting for a week (we had such a lovely time together!! ), and then went down the coast for Christmas. We are now back home, enjoying some relaxing time by the pool, and just enjoying the quiet time before we go back to work on Wednesday next week. Anyway, I am back to share a layout I created for Workout #81 at ScrapFIT. I gotta say, I adore these photos of my youngest son Jamie, he really does hold my heart very firmly in his little hands!!!! For this layout I used a gorgeous layout by Maggie Holmes as my inspiration, whenever I see her new layouts posted over at STUDIO CALICO I am inspired to scrap!!!! I used some lovely ENMARC chippies on this page. Thanks so much for stopping by today, for those who take the time to comment, "thank-you", it means a lot to me!!! Rene, this is so wondetful LO! great use of colors! I love how your boys are your inspiration. No boring photo albums of memories for your sons! WOW Rene, this page is totally fabulous!! I love the mix of colors, the negatives you used, and the Enmarc wood pieces!! Just an amazing layout all around and great take on the Work Out at ScrapFIT!! wow, this is an amazing layout,the photos, and all the colors and elements, really fun to look at! thanks for joining us at scrapfit! 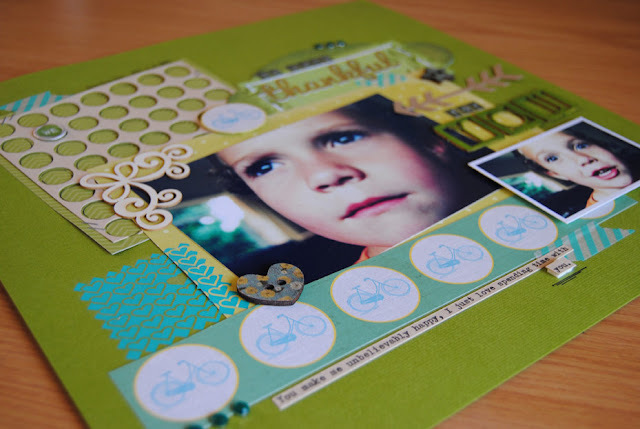 Love this layout Rene and I can see that it is made with sooo much love! Your son is just too cute and the photo's capture him so sweetly! Super layout!